I’m thinking about silos. Those towers or below-ground bunkers used to store things. 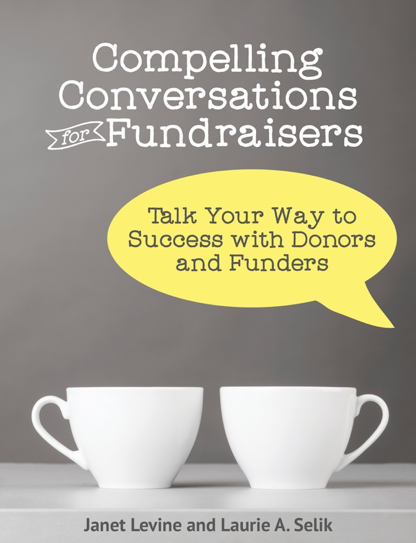 Only I’m thinking about them in a fundraising way: the separation of different fundraising efforts. And I’m thinking that what works for food or missiles really is inappropriate and downright harmful for raising funds. While it makes sense to keep certain items separate from each other, the truth is that fundraising is most successful when it is integrated. When clients who have hired me to help them build an endowment program or increase their individual giving, tell me they can’t meet for 6 weeks because they are deep into dealing with their gala, I despair. The fundraising pyramid, which shows occasional donors and event attendees as the bottom—forming a foundation for the whole—and planned giving at the tippy top, is mean to show the interconnectivity of it all. Donors don’t always stay in one place, they travel up and down the pyramid, but only if they know what else is there. Fundraising is, as we all know, part of the development program (which nestles within advancement or external affairs). Development, as defined by Miriam-Webster is the act or process of growing or causing something to grow or become larger or more advanced. : the act or process of creating something over a period of time. Putting that into fundraising terms, wouldn’t that suggest that the gala is a wonderful step in the process of creating a more sustainable and/or larger donor? Another client is concerned. They just received a rather large grant that requires raising matching funds. They’ll have to put their endowment program on hold, they say as they must first raise this match. But, duh! I think. The grant they got is for a current project. Endowment builds for the future. And fundraising really should be donor-centric, focused on what the donor wants to accomplish—within the scope of your mission and needs. So why wouldn’t you talk with your major donor prospects about the two projects, showing how they fit together and see if they might want to support both. Or if only one is of interest, let the donor decide—you will get a larger gift. Besides, now the donor will know more about all your initiatives and be in a better place to help you reach all your goals. Many years ago, I worked in “Central” fundraising at a university. There was extreme tension between our staff and the development staff at the various colleges within the university. Too often a prospect who was “rated” as a very large donor was solicited by a college for a very small gift. And then they would scream if we approached the donor for something more comprehensive. Everyone loses in this scenario. At a another university where I was one of those college development directors, I worked (completely unheard of!) with the director of another unit. The gift we ended up was far larger—for both of us—than either of us would have gotten separately. You’d think there would be a lesson learned there. You would think. My point, of course, is that donors are complex individuals, with broad interests and desires. And development is about building relationships. As you build those relationships and talk about the myriad things happening at your organization, your donor is likely to become more engaged rather than less. And they are not likely to become confused about what they want to support. Don’t silo your fundraising programs; see them as a whole. 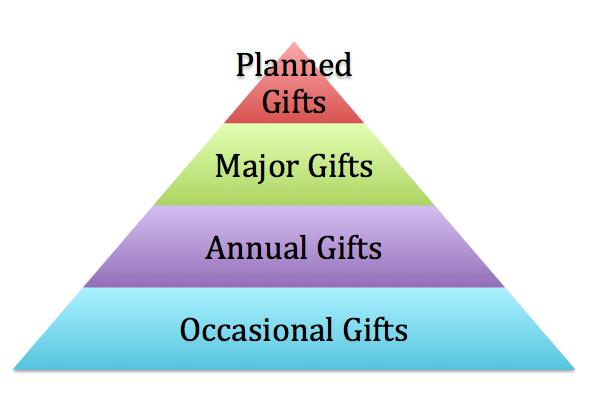 When you talk about a major gift don’t forget to remind that prospect about the ongoing needs that are met via annual giving. And don’t box your major donors into one project when there are several he or she might want to support. Talk broadly about the needs and see where that donor will best fit and design a giving program that will benefit you both. This entry was posted in fundraising and tagged Ask, development, development directors, fundraising, fundraising efforts, fundraising pyramid, silos. Bookmark the permalink.